Published: Jan. 6, 2017 at 12:49 p.m. Updated: Feb. 15, 2017 at 07:26 p.m.
Fantasy football strategies are not cheat codes. They are options. No approach to drafting a fake football team, revolving around outcomes of which you largely cannot control once you hit "submit" on your lineup, represents a foolproof path to success. No human emotion has the ability to undo the best-laid plans like arrogance. It can be blinding, leave us stubborn and afraid of losing the objects that we're so dearly chasing that we fail to see the bigger picture around us. Perhaps there was a twinge of arrogance in the way some of those who chose to support the Zero-RB strategy approached drafting fantasy teams in 2016. To be fair, the objective data heading into this year supported the concept almost flawlessly. Make no mistake, I was one of those individuals. With the strategy and those who support it receiving public backlash during the month of August, I elected to hash out every layer of support for Zero-RB/WR-heavy drafts and pen my thoughts on why drafting that way made sense heading into 2016. For those unfamiliar with the Zero-RB strategy that Shawn Siegele developed, please take a moment to educate yourself by reading the original article from 2013 before casting your judgments upon it. One should not critique what they do not understand. The 2016 season saw running backs David Johnson, Le'Veon Bell, Ezekiel Elliott and LeSean McCoy far and away check in as the best players in fantasy football, reclaiming the throne of dominance from wide receivers. In the coming months, and perhaps you've seen it already, there will be those ready to claim that the Zero-RB strategy is no longer a viable approach and that you must secure a top-tier running back in the early rounds of your draft in order to win. RotoViz writer Ben Gretch noted in a similar study that there's some myth to the re-birth of the running back position. Gretch asserts that Johnson and Bell were certainly fantastic within the context of the running back performances over the last several seasons, but that "they weren't exactly throwbacks to prime Priest Holmes or LaDainian Tomlinson," and that "Ezekiel Elliott was the RB3 at 21.8 PPG, narrowly edging Devonta Freeman's 21.7 as the RB1 in 2015." Regardless, the fact that these running backs performed well doesn't truly matter within the grand context of deciding to fade the position in your fantasy draft as an approach. What we'll attempt to do here is to turn over every stone to see what went wrong with the Zero-RB and WR-Heavy draft approach this season. Additionally, we'll decide what this means for the strategy going forward and whether it is still a viable option in drafting fantasy teams. Note: Any ADP sources cited here are from FantasyPros consensus among multiple sites and any fantasy point numbers are exclusively standard leagues going forward unless otherwise noted. Also, get ready for plenty of charts. The biggest undoing of the wide receiver-heavy users in 2016 was not that several highly drafted running backs hit big this year. Rather, it was that production at the top of the wide receiver pole came in lower than at any point in the last five years. Mike Evans was your top scoring wide receiver in standard leagues this season with 96 catches for 1,321 yards and 12 touchdowns. Not so coincidentally, he also led the NFL in targets with 173. We haven't had a target-leader finish that low since Andre Johnson led the NFL with 171 all the way back in 2009. What makes Evans leading the NFL with that low of a number this season noteworthy is that 16 receivers had more than 173 targets between 2009 and 2015, and three more finished right at 173. Even more striking, 10 wide receivers saw more than 180 targets in just the four years prior to 2016 alone. Overall, the average of volume among the 10 most-targeted receivers from 2016 dipped below the eight-year upward trend line. 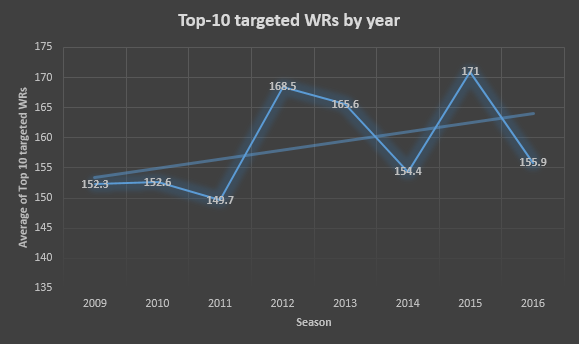 With those 10 players averaging just 155.9 targets this year, it was a down season for wide receiver opportunity at the highest levels. Naturally, this caused a downstream effect on the production at the top-level of the position. T.Y. Hilton enjoyed a strong campaign as the top receiver in Indianapolis. He absorbed 38.6 percent of Andrew Luck's air yards, third-highest figure of the season, and finished with 155 targets in total. With Donte Moncrief's season not going as expected with injuries throughout and Phillip Dorsett not stepping up, it was up to Hilton to shoulder a heavy load. He more than completed the task. That meeting of a dominant season and a large opportunity share helped Hilton finish as the NFL's leader in receiving yardage with 1,448. This stands out as a clear outlier from the upward trend of receiving production, as the NFL has not had a yardage leader finish with that low of a total since Brandon Lloyd's surprising 2010 season in Denver. High-end receiving production had been on a general uptick over the last decade, with some notable peaks and valleys. Obviously, Calvin Johnson's league-leading 1,954 yards in 2012 represent a wildly-high outlier, as it is currently an NFL record. However, let's also call a spade a spade and recognize that Hilton's 1,448 mark this year was just as much an outlier. From 2009 to 2015, 19 wide receivers finished with more than the 1,448 mark that Hilton posted this year. 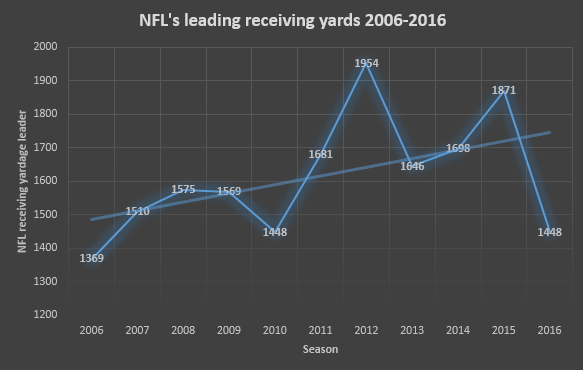 Since receiving production spiked following Lloyd's 2010 season, the history of the last six years indicates that we can reasonably expect the receiving yardage leader in a given year to finish with around 1,600 yards, with the possibility for higher ceilings like Johnson's 2012 or Julio Jones' 1,871 mark in 2015. Perhaps even more notable than Evans' low target-lead or Hilton's 1,448-yard season topping the NFL this year was the fact that Larry Fitzgerald led the NFL with just 107 catches. He, along with Antonio Brown and Odell Beckham, were the only three players to record a catch total in the triple digits. From 2012 to 2015 there were a whopping 21 wide receivers (average of over five per season) finished with more than 100 catches, with the league-leader often finishing much farther north of Fitzgerald's 2016 total. The NFL's reception leader has not finished with a mark as low as Fitzgerald's 107 since literally a decade ago when Andre Johnson led wideouts with 103. The highest reception total in the NFL was on such a clear upward trend over the last 10 years it's hard not to be shocked by what came to pass this past season. What's become painfully clear from perusing the production of the NFL's top wide receivers this year is that 2016 was an outlier year for high-end production. What came to pass this season was a break from league-wide trends at the position constructed and established over multiple years. To say you possibly could have predicted this off any sort of empirical or statistically-driven evidence would be disingenuous. Perhaps you did forecast that the wide receiver position would take a step back this season. But, there's little utility or predictive value to take from what was a correct call in hindsight unless it offers us an avenue to follow again in the years to come. A hunch does not qualify as such. If there is one lesson to take away from the sudden drop-off in top wide receiver production this season, it is that the league can suddenly reverse the trending course seemingly without warning. We should be open to that variance, as we're dealing with a number of different factors that influence the results brought out over a small sample size. What's important for us to do now is try to decipher some potential causes for this fall in the trend line and see what we can use to apply to our decision-making going forward. The most obvious potential root cause for a drop in wide receiver production is that there must have been less passing in the league overall. Back in the piece from August, we noted that the average pass attempts per team in 2015 was 571 and 423 in 1978, while the NFL average for rush attempts per team was 421 in 2015 and 574 in 1978, almost flipping the play-calling on its head. We've long held true to the idea that the NFL is now a passing league, which would buoy the production of the best players at the wide receiver position. On the surface, you could assume that the decline in those players' numbers along with dominant performances by a few running backs meant that there was less passing volume to go around in 2016. However, that was not the case. 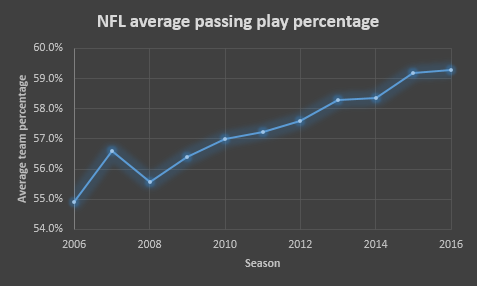 The average NFL team's passing play percentage has been on a clear upward trend over the last decade and has gone up every year since 2008. The 2016 season was no exception as the league average went up .1 percent from 2015. Passing volume from the dominant wide receiver year of 2015 to the slow year of 2016 remained stagnant, at worst. Additionally, rush attempts went down for the fifth-straight season in 2016. 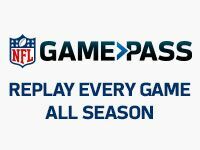 Make no mistake, the NFL is still a pass-first league. Another thought would be that with the top wide receivers absorbing fewer targets this year, perhaps more passing volume was doled out to top running backs. A quick look at the top 50 fantasy running backs' total targets and receptions this year reveals that's not necessarily the case either. The top 50 running backs as a whole collected just 23 more catches than last year and saw one less target than the same group from last year. 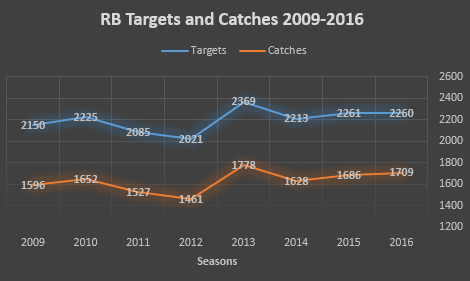 The reception numbers are mostly up since 2009, albeit with some fluctuations, mostly between 2012 and 2013, but there was no discernable spike in the last three years among either catches or targets. Another potential explanation would be a decline in quarterback play across the league. It doesn't take the most acute eye to notice there are more than enough bad signal callers to go around when watching the games on Sunday. However, quarterback play -- at least statistically -- is also rather static as a whole. The league-wide passer rating average has actually gone up each year over the last three from 89.1 to 89.5 to 89.7 in 2016. It gets a bit more interesting when you parse things out individually. One thing we can note in the chart to the right (or above for mobile users) is that 2016 saw the fewest number of quarterbacks (33) throw 200 or more pass attempts than any other season since 2011. What we can also see visually is that the 2016 column reaches the darker cells far earlier than at least three of the four years prior to it. The 26th ranked passer rating mark in 2016 was 79.3, whereas it was 86.4, 83.9 and 81.6 from 2015 back to 2013. Perhaps what we can deduce from this chart is that while overall quarterback play may or may not have been down in 2016, there were possibly some really bad apples at the bottom of the rung holding onto their jobs longer than most producing at their level would. Players like DeAndre Hopkins, Allen Robinson and Brandon Marshall might agree. RotoViz writer Kevin Cole noted that passing touchdowns took a sharp downturn this season despite them trending upward mostly every year heading into 2016. While that could be the effect of those bad apple quarterbacks, it's more likely just the coincidental reversal from rushing to passing touchdowns this season after the numbers had gone the other way in the past few. T.J. Hernandez of 4for4.com helps put that into context by noting that running back's scored on their touches inside the 10-yard at an outlier pace than they did at any point this decade. Something else we saw in 2016 that wasn't the norm over the last few seasons was passing games becoming generally less concentrated. We know that there were fewer high-end target dominators this season, so we can naturally assume that other players needed to absorb the slack. The data backs up this assumption in the next chart. 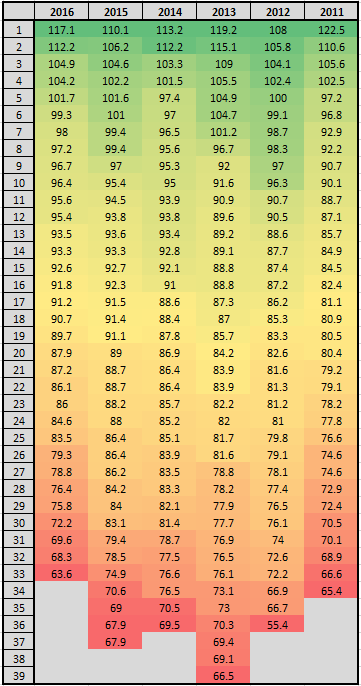 The heat map of the target totals of the top 50 fantasy receivers over the last eight years truly brings what transpired this year into focus. We knew there would be fewer green cells up toward the top with the lack of high-end receivers this season. 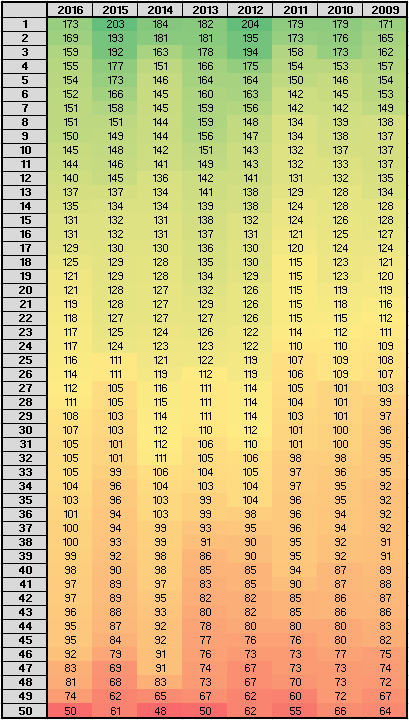 However, what's more notable is just how far that middle range of burnt yellow section stretches. The 46th scoring fantasy receiver in 2016 collected 92 targets this past year. That player collected 79, 91, 76, 73, 73, 77 and 75 targets in the seven years prior. The 2014 season was the only one that shared something similar to the target depth down the wide receiver totem pole akin to what took place in 2016. However, it did not affect the performances at the top of the wide receiver hierarchy like what we saw this year. The top 12 wide receivers from 2014 outscored 2016's group 2,463 to 2,134 as a whole. The WR1 overall in 2014 scored 251.9 points, but just 208.1 in 2016. The WR12 in 2014 scored 176.5 points compared to just 148.9 in 2016. 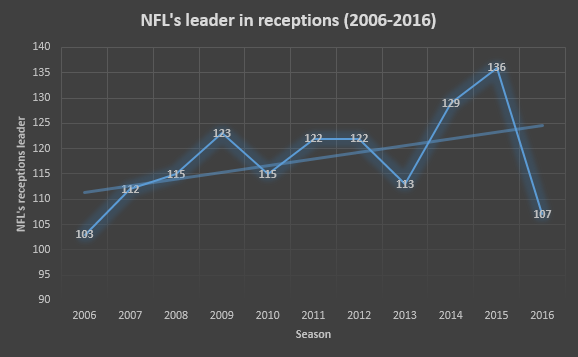 We've at least identified some possible explanations for what caused this outlier year of high-end wide receiver production taking a sharp down-tick in 2016 to occur. What we haven't found yet is a multi-year developing trend that makes us believe what happened in 2016 will repeat next season or any of the others on the horizon. Of course, we might see something like this take place again. If it's next season, then we may have a new order developing. If, more likely, it does not and rather occurs down the line, then we can just chalk it up to the cyclonic nature of the NFL, causing variance throughout the landscape of the league. There's one last factor that could have caused the wide receiver falloff this season. It's a piece of the puzzle that made Zero-RB and WR-heavy drafts so appealing going into this season, but reversed course after steady trends the past few. In the August edition of this piece we learned of Jeremy Funk's revealing study on running back and wide receiver injury rates. At the time, Funk was a PhD candidate working with Harvard and the government to develop a cancer model to predict rehospitalization. Yet, in his far more trivial fantasy football study he showed the increased risk of drafting running backs due to their propensity to get hurt. Funks original study of the top 100 players drafted between the years 2009 and 2015 showed that 92 running backs suffered a significant injury (missing 1/4 of the season) whereas only 70 wide receivers suffered a significant injury. That data clearly pointed to running backs being more likely to suffer an injury that would cause them to miss a quarter or more of the season. I reached out to Funk at the close of the regular season to see what the data from 2016 looked like. After examining the data field from this year, Funk noted that both positions suffered more injuries than a normal year, but that there "was a dramatic uptick in receiver injuries compared to what had been expected after the previous 10 seasons." In the data set collected for this year there were 24 significant injuries at the wide receiver position compared to 18 for running backs. Again, this was the first time that has happened in the last 10 years, according to Funk. Yet again, we have another statistical outlier. When offering an assessment of this occurrence, Funk stated, "In looking at this in an epidemiologic perspective, it is fair to claim this uptick in wide receiver injuries as an "epidemic" (a term which identifies illness that is beyond what is expected mathematically)." The fact that wide receivers were 11.5 percent more likely than running backs to suffer a significant injury was well outside any sort of realm of reasonable expectations, and makes it clear we shouldn't account for this as a new norm. Funk also agrees that we're unlikely to see another year with wide receivers checking in with a higher injury risk than running backs next season. Rather, we should expect the opposite to come to pass. "Personally, I hate the statement 'what was seen was due to randomness'" he said. "However, I fully expect this phenomenon to correct itself back towards the 10-year mean in 2017." To me, it's almost unbelievable that we saw five running backs (David Johnson, Ezekiel Elliott, Demarco Murray, Le'Veon Bell and Todd Gurley) touch the ball 321 times this year and not have even one of them miss a single game with injury. Combined with Funk's research, that's mind-blowing. However, we did receive a cruel reminder of the high injury risk at the running back positon, especially those with bloated volume, in Week 17 when David Johnson had his knee contort on a tackle early against the Rams. Johnson thankfully avoided major injury and his ACL was intact despite the initial event looking like the worst of news was to follow. However, with six to eight weeks of rehab needed, if there were still games to be played Johnson would run the risk of falling into the "significant injury" group of running backs in Funk's study. Thankfully we will get the incredible David Johnson back for the start of next season, but his injury served as an unfortunate warning sign that we can't reasonably expect all the top running backs to avoid serious maladies next year. We've covered why the depressed value of the top-end wide receivers in 2016, and that alone, took the air out of the Zero-RB balloon. However, it wasn't all bad for the drafters that followed this strategy. There were a few parts of this season that swung their way. Zero-RB at its core is a humility-based approach and one that leaves its users ready to benefit from the natural chaos that spreads through the NFL landscape on a weekly basis. The Zero-RB drafter must admit that "we don't know everything," especially when it comes to who the top running backs will be by the end of the season. When those unknowns come to pass or the injuries begin to strike the believed top rushers, the Zero-RB user who is active at hoarding backup running backs stands to benefit. The strategy is much less open to "user error" then several others. The reality that we aren't too proficient at predicting these outcomes was once again apparent in 2016. The ADP predictability of top 15 running backs fell for the second straight year, despite the tremendous performances of a few at the top. Outside of one spike year in 2014, it remains quite hard for us to predict who the top fantasy rushers will be on a year-to-year basis. Top-15 wide receivers crashed down to below a 50 percent predictability rate for the first time in the last five years. Again, we know to chalk that up to the epidemic outlier of wide receiver injuries this season, as well as bottom-barrel quarterbacks being started longer than usual. Top-30 overall running backs remained the most unpredictable group for the second-year in a row. Some of that is players at the position falling off a cliff, but these scores also take into account those who finish 12 spots above their ADP, not just below. We see running backs from the mid-to-late rounds exceed ADP expectations and provide RB1 production all the time. This brings us to our next point. While it's not a main pillar of the theory, it's foolish to ignore that one of the biggest worries Zero-RB brings to a new user is "where am I going to get my running backs, I still have to start two?" If nothing else, 2016 showed us emphatically once again that you can find those late-round values at the position and the fungible nature of who the top backs even are at a given period of time. DeMarco Murray was the RB5 overall this year. Consensus ADP had him as the RB19 this year at 47th overall. While not guaranteed to be there, it's conceivable you could have snagged Murray after the fourth-round this year. LeGarrette Blount can be crowned the Zero-RB king after leading the NFL in rushing touchdowns for an RB7 finish. Consensus ADP had him all the way down at RB36 and 102 overall. Blount was a weekly starter at the position, and offset the loss of not taking a stud running back early. Melvin Gordon was the RB8 this season after a stunning rebound campaign that could have seen him finish higher were it not for a late-season injury. 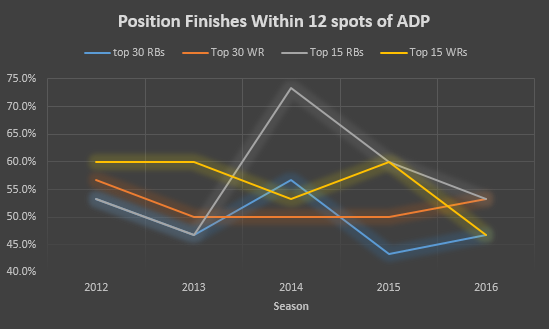 Gordon wasn't a desired back this year at RB23 and 64th overall in consensus ADP. His 16.1 points per game put him fifth, just 0.5 behind McCoy. Jordan Howard finished second in the NFL in rushing this year, behind fellow rookie Ezekiel Elliott, and as the RB9 in fantasy. Way down the list at RB68 in consensus ADP and 225th overall, you probably snagged Howard off waivers. Jay Ajayi established himself as a player with one of the highest weekly ceilings at the position, finishing as the RB11. Arian Foster's arrival in Miami pushed him down to RB37 and 105 overall. There's a better than zero percent chance you actually snagged him off waivers when his original drafter dropped him after Week 1 when Adam Gase left him at home as a healthy scratch. In addition to those players who graduated from the mid-to-late round to become every-week starters there were several running backs who maintained strong value for stretches of the season, even if they did not sustain it. One of the biggest myths of fantasy is that acquiring a player can only be considered a "win" if you snag them and ride them the rest of the season. There's no bonus points for that; get what you can out of them and be ready to move along when the winds of change hit. "Set it and forget it" is overrated when trying to win a weekly game. Running backs like Spencer Ware, Isaiah Crowell, Tevin Coleman, Terrance West, Rob Kelley, Bilal Powell and even Christine Michael all had their moments in the sun when they gave you near RB1 production when they benefited from chaos. Those moments came and went, but that doesn't matter. Those players are still wins for Zero-RB and WR-heavy drafters. All the statistical and league-wide trends-based data indicates that what took place at the top of the wide receiver group this year was an outlier. An event that whether from an injury or overall production standpoint, we simply couldn't have seen coming. Due to that, WR-heavy and Zero-RB teams didn't possess the league-crushing advantage they may have held in years past, even though some owners still found success with them. While counter-punches could certainly be found, it was tough for them to make up the ground against teams with elite running backs. Yet, did the events of 2016 signal the death of the Zero-RB or mark the strategy as a non-viable one? The answer is without a shadow of a doubt, "no." There's no data-based argument to make in asserting these points and in a wildly evolving game that still must declare winners and losers based on a numerical score, data should be at the heart of every discussion. Many of the best teams in fantasy football this season likely did have one of Johnson, Bell, Elliott or McCoy. No purveyor of the Zero-RB strategy sets out to discount the potential impact of elite running backs like the ones mentioned. Yet, if you've noticed, there are only four names there. Most fantasy leagues have 12 teams that need to be filled by the end of the draft. Even in a year of a so-called "running back resurgence" there were just four early-round running backs who went nuclear and provided weekly advantages in every game played. Could the influx of a rumored-to-be stellar rookie running back class and the emergence of the Jordan Howard and Jay Ajayi-types into full-time workhorses add to that pool? That is possible. Yet, if the year-to-year proposition that is the running back position has taught us anything over the last five years it's that the landscape could look drastically different in a negative fashion by the end of 2017, whether by injury or other forms of chaos. Not everyone can expect to walk away from their drafts with one of these elite running backs just by taking one in the first few rounds. As such, what you need is options. The Zero-RB or WR-heavy strategy provides you one of those. That's all it is, just like any other strategy: an option. And it's one that's steeped in layers of data-based logic and proven theories played out over multiple years. The events of 2016 and the fact that four running backs wrecked the league didn't change that. I won't be the one to tell you that you must draft Zero-RB teams in 2017 or any other year in order to win. What I will tell you is that the data backs you up if you wish to use that as an option as your draft board unfolds this August. The only creed I do believe you must hold true to is to disavow any thought that Zero-RB is not a viable approach to drafting.